←What does Your Childhood Reveal about what You Should be Doing Now? 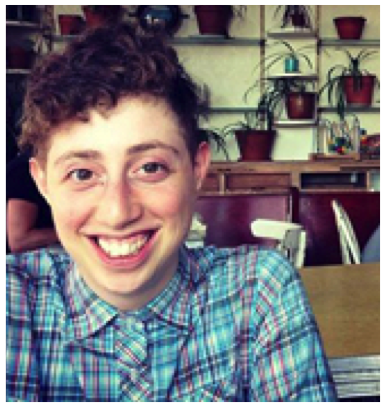 Today’s post is a guest post by my friend, and fellow puttypeep, Joel Zaslofsky. Receiving this piece in my inbox was a complete surprise, and it really warmed my heart. All I can say is that when it comes to my relationship with the puttypeep, the feeling is absolutely mutual! I’ve been hit by snowballs that felt like a ten ton truck. I’ve also found that getting hit with the right snowball can be one of the best things in the world. The difference is in how far and fast it travels, the trajectory, and whether or not it’s expected. Growing up, snowballs chucked by your friends, brother, or sister probably hurt. But the most recent snowball to smack me in the face created one of the best experiences I’ve ever had. And it hit me in the dead of summer. Read on and learn which snowballs you should dodge and which ones you should run into. In a matter of minutes, I understood a Puttylike wasn’t a thing, but rather a state of being. So I did what I sometimes do when I stumble across someone amazing giving their best stuff away for free. I subscribed to Emilie’s RSS feed and, starting from her first post, read two years of content in two days. I kept reading every new post until a comment contest was announced to win a lifetime membership to The Puttytribe. And with a concise and apparently well-worded comment, I was chosen among many deserving people as a winner of the contest. I’m pretty sure I verbally exclaimed “Boo-yah!” after my first few minutes exploring The Puttytribe. There were so many interesting people whose profiles I wanted to view, blogs I wanted to read, and huddles I wanted to attend. And everyone’s shockingly high level of engagement was contagious as I threw myself fully into the beautiful mix. Don’t ask me how or why (ask Shanna Mann and Ethan Waldman), but inside the tribe, I caught the attention of some folks who thought I’d be a good fit for a blog commenting “cartel.” When Shanna asked me to join in May, I happily accepted. Little did I know that what was once a tiny snowball – starting with a link on a blog – was growing big enough to make a snowman. In June, the inspiring Denise Urena posted a message in our cartel forums. She wondered if we could expand the cartel’s scope to periodically chat as a group, offer feedback, discuss goals, and exchange insight. Everyone seemed on board until I came along to muddy the waters. I told them I was all about collaboration, but some guidelines around the who, what, when, where, and why might make our periodic video chats better. What can I say. Defining guidelines is a character flaw of mine. I wanted to know if this was going to be part mastermind, part Puttytribe huddle, or something else I could wrap my noggin around. After much expectation setting, the “Inaugural Cartel Mastermind” was scheduled over Google Hangouts at the end of July. I moderated the two hour call (because that’s what former corporate project managers do) and even took meeting minutes so we could agree on what just emerged. 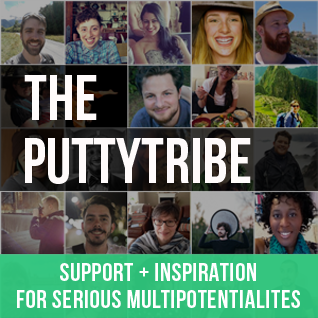 A handful of members of The Puttytribe – originally inspired to join by the content and community at Puttylike – came together to form an amazing lifeline group (it’s a Keith Ferrazzi thing). And the generosity, candor, freedom to be vulnerable, and accountability to each other continues to snowball. This is the power of The Puttylike Snowball Effect. It has given me a gift I couldn’t imagine receiving so soon after leaving my corporate gig. And that would be an intense feeling of belonging. It’s not just belonging to a lifeline group that helps me achieve personal and professional goals that would otherwise be pipe dreams. It’s also belonging to a community of scanners on Puttylike and The Puttytribe who “get me” and my crazy pursuits. Without The Puttylike Snowball Effect from the past six months, my personal renaissance might have slowed down. But the opposite has happened. My confidence toolbox gets a new toy all the time. And I shift from beginner mode into “Hey, I actually know what the hell I’m doing” mode much faster as a result. Your chances of getting hit with your own multipotentialite snowball increases as you become more collaborative with this community. That means leaving comments on posts like this. Or hitting the reply button on the emails Emilie sends to her Puttylike newsletter community. Your snowball will look different than mine and may still be too small to notice. But if you see someone throwing a ball of white multipotentialite awesomeness your way, don’t duck. Engage and branch out. Because you never know when something can snowball into a life changing sequence of beautiful and unexpected events. Have you been hit by the Puttylike snowball? 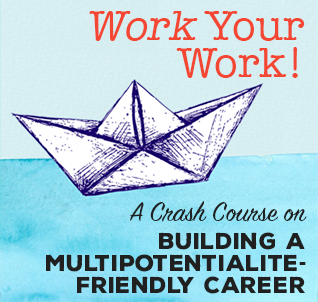 How has interacting with other multipotentialites changed your life? 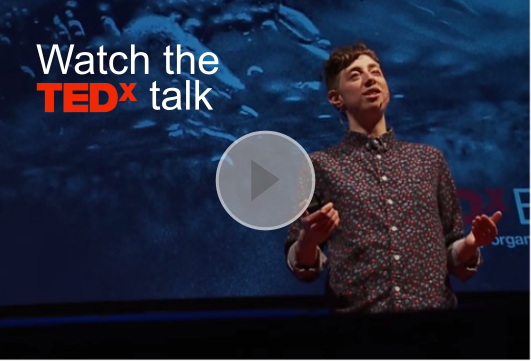 Joel Zaslofsky is the simple-living, community-building, multi-passionate creator of the SimpleREV movement and JoelZaslofsky.com. He also hosts the popular Smart and Simple Matters podcast, is the Connections and Operations Officer for the Puttytribe, and loves connecting awesome people to each other. When he’s not enjoying nature, making his wife smile, or playing with his two young sons around Edina, Minnesota, Joel’s busy experimenting, being Paleo, reigniting his personal renaissance, and Experience Curating. I was going to let someone else comment first, but then I got too excited. Emilie – and all you fellow Puttypeep – it’s a real treat to be able to share this message with you! I hope you already have the beginnings of a “snowball story” or a giant snowman you’ve made with a huge snowball. I’m stoked to hear what everyone else thinks of this post and more importantly, what kind of snowballs you’ve been embracing these days. That’s awesome that you’ve had a similar experience Jo. Between me and you (and the rest of the Internet), I don’t have another place where I can find budding graphic designers (or a group with 1,000 different skills) who want to leverage the needs of the community to help out and further their goals. Support and inspiration aren’t the only currency being exchanged in the Puttytribe! Haha, thanks for that, Joel! You’re also great to work with and I’m so glad I was able to find you and Jonathon through the Puttytribe! Great post Joel. I’ve been a follower of this site for a little over a year now and it’s great to read about people who get me as well. I was particularly inspired by the fact that you weren’t even blogging. Your snowball was even smaller – just a comment. It’s easy to get caught up the need to blog as a scanner – since it’s an obviously great way to smooth interests, but sometimes offering support to others in their endeavors is just as valuable. Thanks for the kind words. Just for the record – not that I’m concerned much with the record these days – I was blogging when I stumbled across Puttylike. Mind you, I was blogging terribly and with such a nebulous concept that it probably would have been better if I wasn’t creating anything at all. But taking my lumps to find my overarching theme, and finding the people who helped me do that, was worth it. Regardless, I could say I started even smaller than a snowball (maybe a snowflake?). But where I am now is so much fun and so fulfilling that it only makes looking back at the initial stages of my personal renaissance that much more rewarding. I’m totally on board with your comment about offering support to others. It’s awesome to see the people you care about do something great because you helped them in some way! It’s great to get a peek in at the Puttytribe through your eyes. It sounds like a great synapse explosion party in there! I found Puttylike through a comment you left on a blog a few weeks ago and have been diving through the content here ever since. “Engage and branch out.” is such great advice. I know if I hadn’t found a small circle of groups and people I could relate to, and share support and ideas with, I wouldn’t be doing what I’m doing now, or even dreaming of doing it. The IDEA of multipotentiality has snowballed for me since finding Puttylike. I see it everywhere. Epic post Joel! I’ve only been around a few months but since being directed to the website Puttylike & then into the PuttyTribe I’ve founds such vast array of uniquely qualified people to interact with & essentially learn from. It’s better than college, well it kind of college all over again but with better experience & people. The spectrum is broad & its such a wonderful experience to share with you all growing a community of people who believe were not destined to settle into just one thing. That right there describes the intensity that you’re hit with when you find & understand PuttyLike. It’s like P90x or the Insanity workout for your mind in EVERY way! This is WONDERFUL! Thank you for the post! Wow Jonathan. Now THAT was some major enthusiasm! I appreciate the comments and I’m sure Emilie does too. I’m happy to see you pop up! This was a really fun story to tell and the richness of the relationships involved only makes it better. Perhaps Emilie can change the hyperlink on your name in the story to http://nurturingcreativity.net/ because your name deserves to be clicked on with all the wonderful stuff you create. As far as I’m concerned, the Puttypeeps are lucky to have YOU! I know you add a lot to the community. My snowball effect has turned more into an avalanche in my life – not my business (just yet ;) but more so my personal life. It’s made me happier and more willing to be vulnerable & share – even if others don’t understand or necessarily agree. It has eliminated the greatest of my fears – being alone AND misunderstood. I’m blushing Candace. Thanks for expressing your gratitude! Your chances of getting hit with your own multipotential snowball increases as you become more collaborative with this community. totally agree anytime you are getting involved, this awesome group or any group you commit to playing full on with, you are going to be successful! My snowball is just a little puff so far, I hope it gets rolling like yours! I read this on Monday and something you said stuck with me, the idea of going to an rss feed and reading an entire blog from the beginning (from listening to your podcasts, that really sounds like something you’d do, ha). But I’m working on starting a new blog myself, and thinking about its focus and where to start, and I kind of want to do that. . . to see what blogs I like started with, like in their first ten posts what did their message & their overarching theme look like? And, technical question. . . how do you do that, get to the oldest posts. . . I’m kind of new to using rss feeds. . .? 1) To the right of the refresh button is an option to see only the recent new items for a feed or all items that the feed has sent to Google Reader. Select the “All Items” option. 2) Make sure the “Feed Settings…” button option is set to “Sort by newest.” For whatever reason, most RSS feeds only display the last ten posts when you use the “Sort by oldest” option. 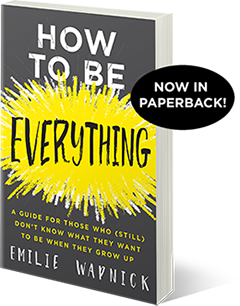 You got me convinced – I’ve got no idea what puttylike is, but hearing about it twice in one day (your blog and here), I’ve signed up for Emilie’s newsletter. Thank you so much for sharing! I just discovered Puttlylike yesterday and spent the day reading it. I’ve always had so much trouble figuring out what my one true passion is and what career I want, all the while I would educate myself in depth over one crazy topic or the other and make these connections that make sense to me, but don’t really make sense to others until I give a little extra info. I’m excited about learning more and figuring out how I’m meant to contribute.